Son of a diplomat Nicholas Courtney was born in Egypt and grew up in various countries. At the age of 18 he was called up for National Service, as a private, which lasted for 18 months. He then attended the Webber Douglas Drama School for 2 years followed by a period in repertory theatre. Appearances in television then followed including the part of Mavic Chen in the 1965 Doctor Who story "The Daleks' Master Plan". He was then cast to play the part of Colonel Lethbridge-Stewart in the 1967 story "The Web of Fear" and then, as The Brigadier, in the 1968 story "The Invasion". He continued to play this part throughout the whole of the Third Doctor's era and then off and on until 1989. He has also appeared on stage, in various films and on television including The Avengers, Juliet Bravo, All Creatures Great and Small and Sink or Swim. He has also played the part of The Brigadier in the Reeltime Pictures video production Downtime in 1995 and also in the Children in Need charity special "Dimensions in Time". He also provided the linking material in the video release of "The Invasion" and has also returned to the role of The Brigadier in two radio plays, along with Jon Pertwee and Elisabeth Sladen, and also in the Big Finish Production's audio stories "The Spectre of Lanyon Moor" and "Minuet in Hell" as well as the UNIT range of audio stories. In 2008 he reprised his role as The Brigadier in the Doctor Who spin-off show The Sarah Jane Adventures. 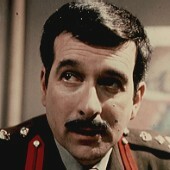 Unfortunately Nicholas Courtney died, after a short illness, in February 2011 at the age of 81. Nicholas Courtney has the unique distinction of being the only actor to have appeared with all of the first eight Doctors. He was with the First Doctor in "The Daleks' Master Plan" (as Bret Vyon), "Dimensions in Time" with Colin Baker and he also met the Eighth Doctor in the Big Finish Audio play "Minuet in Hell" and again in "Zagreus". Actually Nicholas Courtney has actually worked with nine actors who have played The Doctor as he also took part in two Big Finish Audio stories that David Tennant was also involved in (albeit before David Tennant became the Tenth Doctor). These were Doctor Who Unbound #2: "Sympathy for the Devil" and "UNIT: The Wasting". Brigadier Alistair Gordon Lethbridge-Stewart was the Commanding Officer of the British branch of the United Nations Intelligence Taskforce (UNIT). However, his first appearance was as a Colonel during the Yeti's second invasion attempt in the 1968 story "The Web of Fear". It was during this story, while in the deserted London underground, that he met The Doctor and they became good friends. Soon after this story he was promoted to Brigadier and was given the command of the newly formed UNIT, having been a key played in persuading the UN to form an organisation to deal with threats like the Yeti after their last attack. His next encounter with The Doctor was in the 1968 story "The Invasion". He instantly involved The Doctor in helping him sort out the Cybermen's attempt to invade Earth and during this story their friendship is strengthened. As The Doctor was still in his second incarnation it is not surprising that when they meet again, after The Doctor was forced to regenerate, that he did not recognise him. However, when he was finally convinced that this stranger is The Doctor he was quick to persuade him to become UNIT's scientific adviser, even though this post had already been offered to Liz Shaw. In exchange for The Doctor's continued assistance at UNIT, The Brigadier allowed him to use UNIT's resources in his attempt to repair the TARDIS. He even supplied The Doctor with an Edwardian roadster which The Doctor named Bessie, and which he retained for The Doctor's use even after The Doctor and he had retired from UNIT. They made a good team mainly due to their mutual need for each other, despite The Brigadier’s decision to resort to a military solution causing conflict with each other at times, although The Doctor came to accept that his friend only resorted to such methods when he was sure that there was no other choice. It was also during this period that he became heavily involved with the renegade Timelord known as The Master. The capture of The Master became one of The Brigadier's crusades as he too was humiliated by The Master just as much as The Doctor was. The Brigadier was also involved with Autons, the Silurians - this encounter causing particular damage to his relationship with The Doctor as he destroyed the Silurian base despite The Doctor’s belief that the two sides could work together -, Omega, an invasion of dinosaurs and of course the Daleks. Unfortunately, these events resulted in the breakdown of his marriage to his wife Fiona as he was unable to tell her the truth about his work with UNIT, resulting in the two of them divorcing during The Doctor's attempts to make peaceful contact to a newly-awoken group of Silurians in "The Scales of Injustice". The two never successfully reconciled, although The Brigadier did go on to make peace with his daughter Kate during the events of "Downtime"; he even learned that she had named her son after him. The Brigadier appeared throughout the whole of the Third Doctor's era and so became use to The Doctor's eccentricities, ranging from his unusual stories about meeting historical figures to his unique approach at dealing with strange problems. However, nothing could have prepared him for the events of Omega’s assault on the universe, where The Brigadier not only had to accept that he had actually travelled to an alien world in the TARDIS - to the extent that he was initially convinced they had arrived in Cromer -, but was forced to accept the return of the Second Doctor, initially assuming that The Doctor had simply been messing around with the TARDIS and caused his body to revert back to its previous form. Although Benton supported The Doctor’s story, The Brigadier continued this belief until he saw the Second and Third Doctors together, noting after witnessing the First Doctor that he didn’t know when he was well off, and reflecting after the earlier Doctors had departed that one Doctor was more than enough ("The Three Doctors"). While this story marked the end of the Doctor’s exile to Earth, he continued his service with UNIT for the rest of his third incarnation, until he was forced to regenerate again after his battle with the Giant Spiders, the Brigadier witnessing the transformation before his very eyes with a solemn observation of ‘Well, here we go again!' he muttered ("Planet of the Spiders"). The Brigadier came from an old Scottish family with a long military tradition and, as expected, he was always neatly dressed in uniform and with his neatly trimmed moustache he is the typical perception of a British Army officer. He has a keen and flexible mind... which was fortunate considering the many encounters with alien species and his close association with The Doctor! He was fiercely patriotic and his first initial response to any alien attack was to shoot it or blow it up, with his typical response of 'Jenkins. Chap with wings, there. Five rounds rapid' ("The Dæmons") reflecting his habit of shooting first and asking questions later, as well as being a stickler for military correctness, although he was willing to put protocol aside if the situation was urgent enough. Despite a rather abrupt manner and a clipped voice he would never ask his troops, or his fellow officers under his command, to do something dangerous that he was not be willing to do himself. This resulted in him getting fully involved directly and he would often been seen in the thick of a battle. 'I am not entirely desk bound yet you know' he comments in "Terror of the Autons". He was willing to do whatever was necessary despite knowing that The Doctor would disagree with some of his actions, most notably in his dealings with the Silurians. As The Doctor comments in the story "Terror of the Autons" 'I sometimes think that the term "Military Intelligence" is a contradiction in terms'. He remained a steadfast, though often bemused, friend to The Doctor despite their many confrontations ('Pompous, self-opinionated idiot, I think you said, Doctor!' he commented in "Inferno" after The Doctor's attempt to leave Earth, via the TARDIS console, failed). However, he mellowed with age and his relationship with The Doctor became less and less abrasive, The Brigadier regularly demonstrating a willingness to accept The Doctor’s recommendations even when faced with contradicting orders from his superior officers. When The Doctor's exile to Earth finally came to an end The Brigadier was forced to get use to The Doctor wandering off more and more in the TARDIS, although he always had faith that The Doctor would be available in a real emergency. Although The Doctor ceased to regularly return to UNIT after he regenerated into his fourth incarnation, despite the many changes to The Doctor's appearance and character over his subsequent incarnations, their friendship stayed as strong as ever, The Doctor consistently regarding The Brigadier as the best soldier he knew and UNIT often calling upon him when circumstances required The Doctor’s aid. As his job at UNIT progressed it became more politically orientated and he had to spend more time in Geneva, the main Headquarters of UNIT. Therefore apart for a few stories during the early part of the Fourth Doctor's era - during which he helped The Doctor choose his new outfit, his initial costumes including a Viking warrior and a clown before he settled on his trademark scarf and coat - he is not seen in the next two UNIT orientated stories. The Doctor and he still remained close, to the extent that The Doctor actually preferred to try and help find the kidnapped Brigadier than investigate a potential threat to the universe (Although both situations were resolved when it was revealed that the two were connected ("Heart of TARDIS")). Shortly after this, The Brigadier encountered the Seventh Doctor, Ace and Bernice Summerfield as The Doctor's old foes, The Meddling Monk and the Vardans, attempted to conquer Earth, The Meddling Monk having attempted to turn UNIT against The Doctor by implanting hypnotic suggestions in recently-supplied virtual reality training equipment. Fortunately, The Brigadier's Buddhist meditations - having converted to Buddhism inspired by The Doctor's example - rendered him and Sergeant Benton immune to the hypnosis, as he was able to recognise and resist the subliminal messages in the VR equipment. Despite The Doctor's best efforts, The Meddling Monk managed to get himself appointed UNIT's new scientific advisor, allowing the Vardans to attack Earth. The Doctor managed to drive the Vardans away, but not before The Brigadier was shot by one of The Meddling Monk's allies. Fortunately, Ace was able to make contact with a Chronovore whom The Meddling Monk had been using to change history, and, having freed the Chronovore, managed to change history so that The Brigadier was saved. Knowing that The Brigadier's brand of soldiering wouldn't work in the decade to come, The Doctor hypnotised The Brigadier to retire from UNIT for his own good, also making him forget their last adventure. After this encounter, his next involvement with The Doctor is not until the 1983 story "Mawdryn Undead", when The Doctor has regenerated into his fifth incarnation. It is then that we learnt that The Brigadier had eventually retired from military life and, in 1977, had gone to teach 'A' Level maths at a public school. It is here that he met Tegan Jovanka, who was one of the Fifth Doctor's assistants, and found himself, along with Turlough, one of the schoolboys, on an alien space ship. It is here that not only did he meet the Fifth Doctor but his future self from 1983, the result of which caused a discharge of time and his apparent nervous breakdown and amnesia (Relating to anything connected to his meetings with The Doctor in UNIT) from 1977 to 1983. He met The Doctor again the day before an annual UNIT reception that he had been invited to attend. At first it is another unexpected visit by the Second Doctor but he soon finds himself in the Death Zone, on the Time Lords home plant Gallifrey. It is here that he assisted four incarnations of The Doctor to defeat Borusa, a paranoid Time Lord and meets up with some of The Doctor's other companions and The Master. Despite all of these events he has now become conditioned to accept the strange situations that he found himself in, easily accepting the presence of the multiple Doctors, saying that they're 'Splendid fellows... all of you', and subsequently helping The Doctors take The Master by surprise during the final confrontation in Rassilon's Tower ("The Five Doctors"). His final association with The Doctor was during the 1989 story "Battlefield" when he eventually comes out of retirement, where he is enjoying life in the country with his wife Doris, to help the Seventh Doctor and Ace defeat Morgraine and her forces at Carbury. During the final battle with 'The Destroyer', a demon that Morgraine had awakened to destroy the world, he nearly got himself killed when he sacrificed himself to save the Earth by shooting the Destroyer with silver bullets, but survived, and went on to become an unofficial consultant to UNIT. Subsequently rejoining UNIT as an advisor, he helped UNIT make contact with the Fifth Doctor while investigating terrorist bombings in Los Angeles in "The King of Terror" in 1999, which turned out to be the work of two alien races going to war around Earth. Shortly after these events, The Brigadier was also involved in the events of "The Spectre of Lanyon Moor", where he helped the Sixth Doctor and Evelyn Smythe avert the destruction of Earth by a Tregannan ship operating on autopilot after the death of the only person capable of operating it. Two years later, after seeing a recording of imp-like creatures that were invisible to the naked eye, he contacted the Sixth Doctor for assistance, and ended up helping The Doctor deal with a Fourth Reich led by the secret son of Adolf Hitler, although this mission tragically resulted in the death of new companion Claire Aldwych ("The Shadow in the Glass"). Some time after this, The Brigadier - who had apparently recently helped create a new Scottish Parliament - was sent to America to oversee the joining of new state Malebolgia, created by the Hellfire Club and overseen by Brigham Elisha Dashwood, a television evangelist who believed that he had made contact with demons, including Lucifer himself ("Minuet in Hell"). While touring Dashwood's institute for the insane, The Brigadier discovered an amnesic Eighth Doctor, whose memories had become fractured between lunatic Zebediah Doe and journalist Gideon Crane; both of them remembered different aspects of The Doctor's life, but neither could be certain which one was the real Doctor. As Dashwood selected Charley to become his Queen in the Hell he was intending to bring to Earth, Zebediah realised that he was the real Doctor, and, having restored his full memories, worked with Gideon Crane and The Brigadier to expose Dashwood's plans on live television before he was banished to the dimension of the creatures he'd been trying to summon. Some time after this, during the events of "Happy Endings", The Brigadier, now dying of old age, was invited to the wedding of the Seventh Doctor's companion Benny, where The Doctor restored his old friend's memories of his confrontation with The Meddling Monk, and promised to care for The Brigadier's family after he was gone. During an attack by The Master, who was attempting to create a new body for himself, The Brigadier was killed while saving the life of one of the guests, but thanks to the aid of the former Timewyrm, he was brought back to life in a younger body. Shortly after this, however, in "The Shadows of Avalon", The Brigadier's life was changed forever when his wife, Doris, died in a boating accident, leaving him in a funk that continued until he, the Eighth Doctor, Fitz Kreiner and Compassion were accidentally pulled into the dream world of Avalon - inhabited by a Celtic people who had been relocated by the Time Lords in the past. With the TARDIS destroyed in the transfer, The Brigadier remained distant from The Doctor, not even telling his old friend about the loss of his wife, but, in the end, during the war between the humans and the Silurians of that world - sparked off by Time Lord agents seeking to trigger Compassion's transformation into a Type 102 TARDIS - The Brigadier finally accepted that life was only what it was because nothing lasted forever, and, even if he could keep Doris alive forever, it wouldn't be really living if he wasn't able to properly treasure the good times they spent together. As the tear between the two worlds closed, The Doctor and Fitz departed in the transformed Compassion, while The Brigadier remained in Avalon with its ruler, Queen Mab, who he'd developed feelings for during his time there (Although he eventually returned to Earth to die of old age in 2050s ("The King of Terror")). Throughout The Doctor's life, The Brigadier remained The Doctor's oldest non-Time Lord friend, and his friendship has long been one of the few constants The Doctor can rely on in any time, regardless of whatever situation it is they face. His influence was so powerful that, when the TARDIS created a holographic avatar during the "Zagreus" crisis, it chose The Brigadier's physical form to communicate with The Doctor and his current companion Charley Pollard, reasoning that The Brigadier was someone who had been important to both of them (Admittedly, this was a TARDIS that had been corrupted by the energies of anti-time, but it was freed of that influence eventually, and it still says a great deal about how much The Brigadier meant to The Doctor). The Brigadier has not appeared in the new series with the Ninth and Tenth Doctors, either in the novels or in the television show. However, in "The Sontaran Stratagem/The Poison Sky", while working with UNIT against the Sontarans, the Tenth Doctor briefly expressed a wish that The Brigadier was present, with Colonel Mace - the current commander of UNIT - assuring The Doctor that he agreed with The Doctor’s assessment of ‘Sir Alistair’s’ character, but that he was currently isolated in Peru for reasons unknown. The Brigadier himself later appeared during The Sarah Jane Adventures, helping his old colleague and fellow past companion Sarah Jane Smith break into UNIT archives to steal a scroll that was being sought by an alien race called the Bane, who had kidnapped Sarah’s genetically-engineered adopted son Luke (Sarah didn’t want to go through official channels as she feared the consequences of drawing attention to Luke’s existence). Once again, The Brigadier made it clear that he was still a capable soldier regardless of his age, shooting one of the Bane disguised as a UNIT soldier with a gun concealed in his cane and expressing a strong dislike for UNIT’s current methods. When he received news of his death ("Let's Kill Hitler"), the Eleventh Doctor decided to spend his last hours looking in on his old friends, but when he called the Brigadier's home to check if he could visit, he learned that his oldest friend had passed away peacefully some months ago. Although the Brigadier's nurses assured The Doctor that he had always spoken warmly of the Time Lord, even leaving a second glass of brandy out each night in case The Doctor decided to visit, The Doctor was clearly deeply affected by this news, recognising how time could catch up even with him as old friends ceased to be there any longer ("The Wedding of River Song"). He even went on to attend The Brigadier's funeral, where he witnessed Liz Shaw, Jo Grant, Sergeant Benton and Captain Mike Yates along with his second, third, sixth, seventh and ninth incarnations ("Shroud of Sorrow"). On a later occasion, the Eleventh Doctor attempted to infiltrate an American military operation in 1963 by disguising himself as then-Colonel Lethbridge-Stewart, donning a military outfit and a fake moustache, but this plan failed when an inquiry revealed that the real Lethbridge-Stewart was on manoeuvres in Salisbury Plains ("Shroud of Sorrow"). Although he had assumed that his death ended his association with the Brigadier, the Twelfth Doctor was given a final chance to see his old friend when the latest plot of the resurrected Master featured humanity's dead being converted into an army of Cybermen to spread out across the universe. Despite having been reanimated as a Cyberman himself, The Brigadier's love for his planet, his daughter and his friend proved strong enough to overcome the Cyber-programming, allowing him to save his daughter Kate - the current head of UNIT, although she went by Kate Stewart to ensure that she wouldn't receive any favours - when she fell out of a plane during the struggle. When the Cyber-army was commanded to destroy itself by Danny Pink, the converted boyfriend of The Doctor's current companion Clara, the Brigadier remained behind to watch his friend, killing the Master in order to spare The Doctor or Clara from having to do it. Deducing the identity of the last Cyberman when he discovered that Kate had survived, The Doctor, noting that The Brigadier would never be anywhere else but by his side when Earth and The Doctor faced their darkest hour, gave The Brigadier the final salute his friend had always wanted, The Brigadier nodding in acknowledgement before he departed to destroy himself with the other Cybermen, continuing his long tradition of saving Earth alongside The Doctor ("Dark Water/Death in Heaven"). Even with the Brigadier gone, The Doctor has formed a new but seemingly strong relationship with his daughter Kate, the two first meeting when the Eleventh Doctor was investigating mysterious cubes that had landed on Earth ("The Power of Three"). Despite Kate's military background, she ran the organisation with a focus on scientific research rather than purely military-based tactics, commenting that her father had taught her to focus on science based on his friendship with The Doctor. Even in their first meeting, The Doctor and Kate were grateful for the chance to work together as they analysed the cubes, Kate noting that he was as remarkable as the tales she had heard from her father, The Doctor in return assuring Kate that she was just as exceptional as The Brigadier. As the two have continued to work together, with Kate meeting three Doctors when they drew up a treaty between Earth and the invading Zygons ("The Day of The Doctor") as well as appointing The Doctor president of Earth to coordinate their efforts against the Master's Cybermen army, it seems as though the legacy of The Doctor's friendship with The Brigadier would go beyond The Brigadier's own life, with his daughter upholding the values that the Brigadier had always sought to defend. Generally, fans agree that one of The Brigadier’s most memorable moments is in his confrontation with Bok, a demonic statue created by the powerful Azal when he manifested on Earth. While attempting to destroy Bok, The Brigadier gave the order ‘Chap with wings there; five rounds rapid’, the line itself being long remembered - and even used as the title for Courtney’s biography - outside of the television series. Despite his age, The Brigadier has regularly shown a refusal to give up despite the odds against him, as seen most evidently when he actively assisted the Sixth Doctor and Claire Aldwych in tracking down the Fourth Reich	despite his official retirement and greater age compared to his companions ("The Shadow in the Glass").